Gambit Morra 1 e4 c5 2 d4 cxd4 3 c3. The ambitious approach of the game is white against the Sicilian defense. 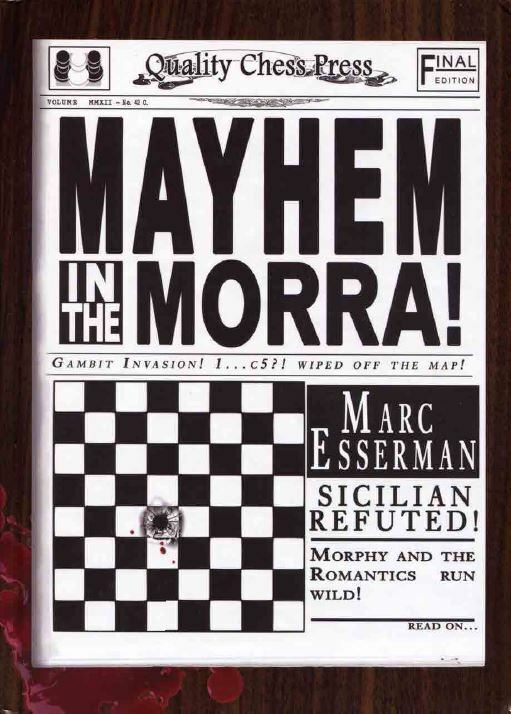 The material is based on the book Esserman Mark - Chaos in Morre 2012, where on 326 pages the author paints a full repertoire for whites, including Adopted and Rejected Morra. In the course of work on the translation of this book, additional new lines were added, and most importantly the estimates of the modern engines of Houdini, Stockvish at a depth of 40-50. Editorial May, 2018! Gambit Morra, this is a special style of play, a style to impose a house on the enemy. As a result, the player who knows the typical victims of the knight on d5 gets the advantage. Have a good hunting! Output format: cbh. It is oriented towards Cb13-14. If necessary, a pdf version will be sent. Foreword mg Loek van Wely 2700+: ... when Mark ventured on l.e4 c5 2.d4, I thought: "Is he serious? Will we play in a cafe today? "Now I know the answer! I was shocked by the impressions of the game, forcing me to seriously consider Morra. I must admit, life with Morra is still not easy. I´m sure that in this book Mark will provide you with a lot of interesting ideas and analyzes. I am also convinced that you will have interesting games, at the price of only one pawn!